POSBay Pty Ltd presents TeachWell two module carts designed to accommodate iPads and tablets. Designed to hold 32 tablets with a 10” display or smaller, the carts include TeachWell TMC outlet/power cord kit and TeachWell power cord kit. 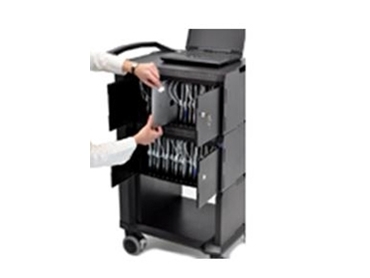 The TeachWell carts feature an open architecture for fleet management of tablet devices, allowing for a flexible response to future technology changes. The universal design accommodates iPads and several tablets, which charge via USB.